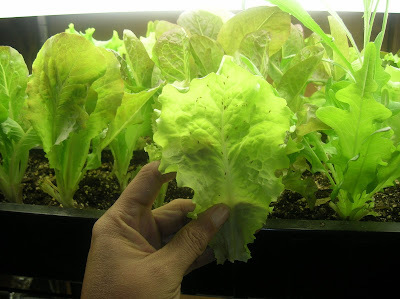 If you are without a heated greenhouse and you want to get off to an early start, you can sow your lettuce seed indoors. They will grow quickly, so you may wish to skip sowing them into seed trays and instead sow them directly into small pots or compartmentalized packs. Just make sure that you use containers that are large enough for the young plants to reach garden size without the need for potting on. Fill your tray or container with John Innes 'seed and potting' mix to within a half-inch of the rim, then tap the side of the container to help settle the mix - top up with additional compost as necessary. If using pots or cells, place a few seeds into each one, and then give a light covering of compost, firming it down gently over the seeds. If you are using a seed tray then give an even sprinkling of lettuce seeds across the whole tray at approximately 5 seeds per square inch. Once done, give a light covering of compost and water in. Label with the variety and date of sowing, and place in into a covered propagator making sure the vents are fully open. This can now be left in a bright, room, but out of direct sunlight. Be aware that the more light the seed tray receives, the better germination of lettuce seeds you will get. Once the lettuce seedlings reach about 2 inches in height, thin out and discard any that look weak. Those in the seed tray can be pricked out and potted on into a standard potting mix. Those already in pots can be hardened off in preparation for moving outside. To harden off successfully they can be placed into a cold-frame outside during the day but keep the lid closed for a couple of weeks. Don’t forget to bring them back in over night – especially if a frost is forecast. Afterwards they can be left out both day and night, and the lid can be left open on dry, frost free days. Just remember to shut it again at night. After a further week or so, or when frosts are no longer expected, leave the lid open day and night for a week before planting outside in to their final position. 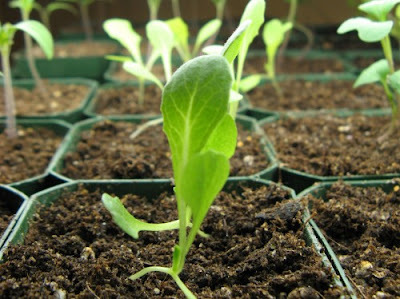 If your seedlings have been grown in a heated room then they will need to be hardened off earlier by moving them into a bright unheated room for a week or so first.